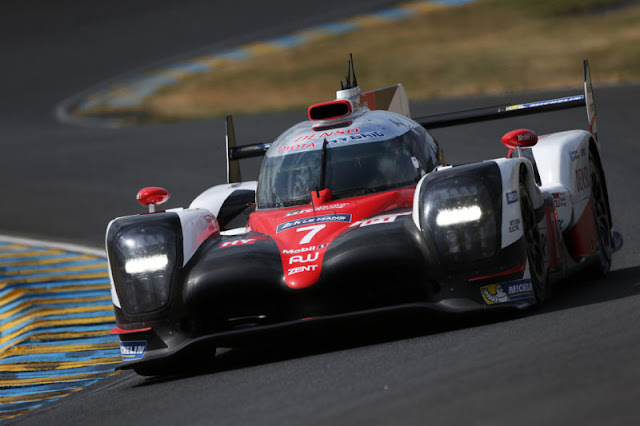 Fernando Alonso won Le Mans 24 Hours at the first attempt as he and team-mates Sebastian Buemi and Kazuki Nakajima finally ended Toyota's long drought. Toyota had never won the sportscar race despite years of trying but finally delivered in an event in which they were effectively without opposition. Alonso's victory completes the second part of motorsport's 'triple crown' for the two-time Formula 1 world champion. Twice a Monaco Grand Prix winner, he now wants to win the Indianapolis 500. Only Englishman Graham Hill has won all three classic races in the entire history of motorsport. Alonso joined Toyota's World Endurance Championship (WEC) programme this season with the aim of winning Le Mans, and is dovetailing it with his programme with McLaren in Formula 1. Toyota are the only team competing with a hybrid car in the top LMP1 class, and the privateer-run non-hybrids are not fast enough to challenge them. The presence of a sporting icon at Le Mans guaranteed the race, Toyota and the WEC far greater international attention than had it been six lesser-known drivers competing in what was effectively a private Toyota battle. Nakajima - who, like Buemi, is a former F1 driver - put Alonso's number eight car on pole position and the lead see-sawed between it and the number seven machine shared by Briton Mike Conway, Japanese Kamui Kobayashi and Argentine Jose Maria Lopez for much of the first half of the race. The advantage seemed to have swung to the number seven car when Buemi was penalised with a 60-second stop-and-go penalty for speeding in a caution zone shortly after night fell on Saturday. That put Alonso's number eight car more than two minutes - two thirds of a lap - behind and apparently facing an uphill struggle to get back into contention. But in a series of stints in the dead of night, Alonso clawed back the deficit and put the number eight car right back on the tail of the number seven. In the 16th hour of the race, Nakajima retook the lead and the number eight car was in control for the duration. However, there were still scares that provided reminders of Toyota's failure to deliver a victory in previous years - most famously when their car broke down while leading on the final lap two years ago. Toyota escaped a penalty when the number eight car's wheels were seen to be moving before it had touched the ground, which is not permitted, during the pit stop when Alonso handed the car to Nakajima for the final two stints before the finish. And Kobayashi missed a pit stop in the penultimate hour and had to complete much of a lap on electrical power alone because he did not have enough fuel. But in the end, both cars made it to the finish, to complete the company's dream result - a one-two, with Alonso's car the victor. Jenson Button, the 2009 F1 world champion, was competing in the non-hybrid LMP1 class for the Russian SMP team. His car was out of contention early on after spending two hours in the pits with an engine problem. It rejoined the race but retired with engine failure during the final hour.